When her mother suffered a stroke at age 51 that left her paralyzed on her left side, Sara Martinko, her father and sister suddenly became caregivers, a life-changing experience. “We were pretty strong as a family going into it,” recalled Martinko, a graduate student at the Wright State University School of Professional Psychology. But she said the family didn’t get the benefit of any outside resources or support. And it left her wondering how other families of stroke victims are able to handle the increased responsibility. The poster has been accepted for presentation at the American Psychological Association’s 2019 annual Rehabilitation Psychology Conference in Orlando, Florida, in February. Rehabilitation psychology focuses on the study and application of psychological knowledge and skills on behalf of people with disabilities and chronic health conditions. Its goal is to maximize health and welfare, independence and choice, functional abilities and social role participation across the lifespan. Martinko believes presentation of her poster at the conference validates the importance of her research. “It shows that they are interested in it and it’s something that’s relevant and impactful,” she said. Martinko said families of stroke victims are often caught off guard because strokes can come suddenly without warning. And sometimes stroke victims are released from hospitals before they are really ready, putting more pressure on home caregivers instead of health professionals more equipped for it, she said. Adding to the pressure is that families sometimes don’t feel capable of caring for stroke victims and the victims often feel they are a burden. There can also be financial pressures. Martinko said family caregivers can benefit from interventions, which can include education, resources, support groups and individual and group therapy. After graduating from Canfield High School in 2013, Martinko enrolled at John Carroll University in Cleveland to study psychology. In 2017, she graduated with a bachelor’s degree in psychology with a concentration in forensic psychology and a minor in behavioral forensic science. 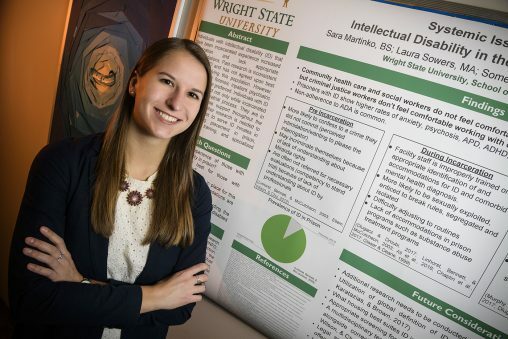 Martinko was attracted to the School of Professional Psychology at Wright State because of its welcoming atmosphere. She loves how the school combines classroom learning with actual experience. She currently works as a psychology trainee at South Community health center and has about 20 clients. After graduation, Martinko hopes to work as a correctional psychologist in a prison or jail setting.